5 years ago, teacher and kosher slaughterer Moshe Yaish-Nahari HY”D was killed in his native Yemen by a Muslim extremist. Following their father’s murder, five of the Nahari children made aliyah to Israel, leaving behind their mother, Lousia, and four other children. 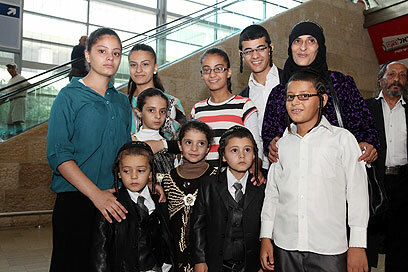 Yesterday, with the assistance of the Jewish Agency, the family was reunited at Ben Gurion Airport. Thank G-d! I would venture a guess that hte four chiuldren who are not smiling are the ones who just came over with here. it’s got to be overwhelming. wonderful, but overwhelming.